Editors Note: This article is part of a five-part package dealing with operating costs in 2016. 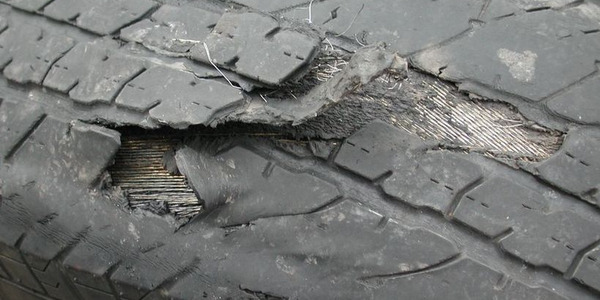 Read related articles that offer and in depth look at Tire Prices, Fuel Spend, and Fleet Maintenance, as well as an overview of operating costs in 2016. 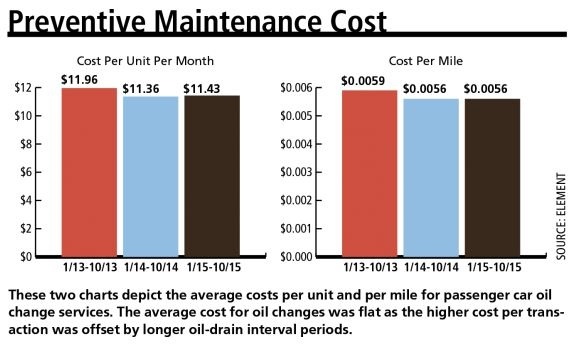 Overall fleet preventive maintenance (PM) expenses in calendar-year 2016 are flat, primarily due to improvements in engine design and onboard vehicle technology, along with improved oil quality, which is allowing fleets to extend oil drain intervals. 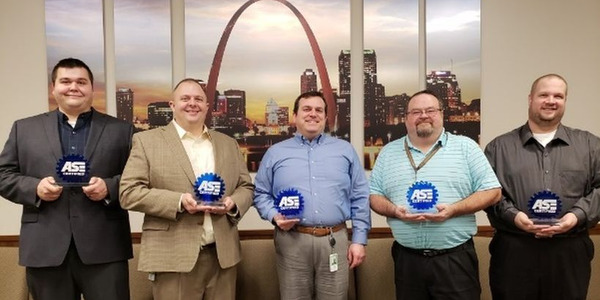 More automotive manufacturers are recommending more stringent motor oil requirements, such as the use of synthetic motor oils, which is increasing the cost of each preventive maintenance service. But, the higher quality motor oil also allows the intervals between these services to lengthen, which is offsetting some of the additional per-transaction costs. Also, contributing to the industry-wide trend of extended oil drain intervals is onboard oil life monitoring systems that are installed as standard equipment in some popular fleet models. 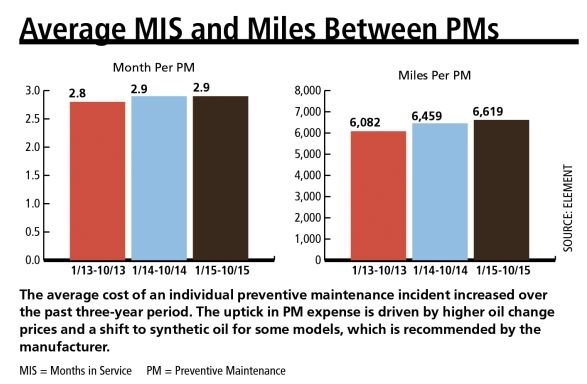 Increased costs per PM service costs will continue as more vehicles requiring conventional oil are taken out of service and replaced with models that require synthetics. Oil change costs in 2016 have increased on average 10% for several major national chains. The increased cost is offset by the decreased frequency of oil drain intervals, resulting in less downtime. 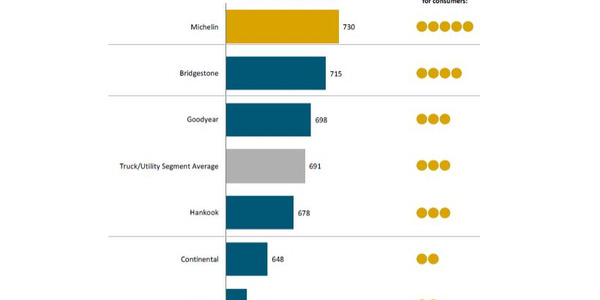 “Oil change costs in 2016 have increased on average 10% for several major national chains. We expect these charges to stabilize in 2017 if crude oil prices do not significantly increase,” said Chad Christensen, strategic consultant for Element Fleet Management. However, longer drain intervals are offsetting the higher per-transaction price, making PM costs, on average, flat for CY-2016 when compared to CY-2015. Making a similar observation is Wheels. “As manufacturers increase oil service intervals, it is critical that drivers monitor the engine oil level between services. Engines consume oil over time and, the longer the interval, the more oil is consumed. This is especially true with diesel engines,” said Brian Simek, senior manager for fleet repair services for Wheels Inc. While oil drain intervals have increased, the proliferation of smaller displacement engines in fleet applications is putting pressure on OEMs and fleet managers to use synthetic oil to maximize engine life. 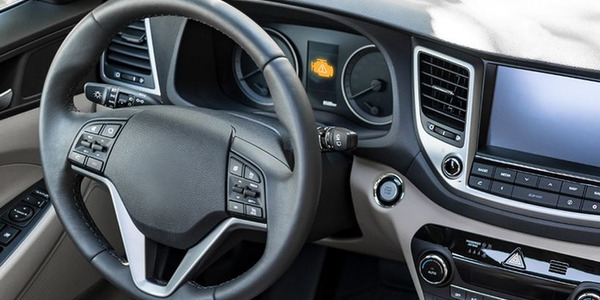 Most manufacturers have extended oil change intervals and switched to synthetic oils a few years ago. “Total oil costs have increased slightly, year-over-year, as more vehicles are utilizing synthetic oils. 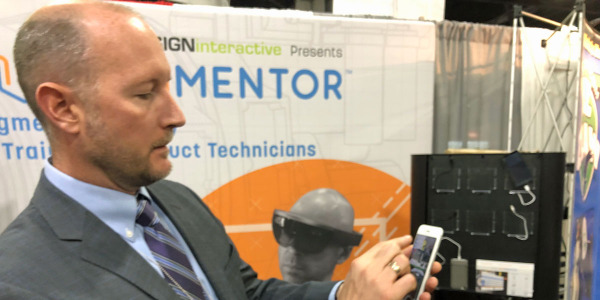 The increased cost is being balanced out by the decreased frequency of services, resulting in less downtime for oil services,” said Bill Croke, manager of TotalView Analytics for Merchants Fleet Management. Beginning in December, fleets operating diesel trucks will have two new lubricant options. CK-4, which supersedes CJ-4, was developed to address two specific issues: improving oil performance/longevity by dissipating heat and improving miles per gallon. CK-4 will be available in multiple viscosity grades: SAE 15W-40, Synblend 15W-40, 10W-30, and full synthetic SAE 5W-40 and 5W-30 grades. CK-4 may also have emission system benefits for DPF-equipped vehicles helping to maximize service lives. CK-4 will be compatible with any diesel engine currently using CJ-4, including off-highway equipment. FA-4 is being introduced in limited applications and is designed specifically for 2017 and later diesel engines. FA-4 is different from CK-4, and will be offered in lower viscosity grades. Although many fleets utilize CJ-4 interchangeably in gasoline and diesel engines, FA-4 is not formulated for gasoline engines, and should not be used in them. Agreeing with this assessment is EMKAY. “Overall, the impact on fleets has been minimal as oil prices have remained relatively steady from 2015 throughout 2016,” said Dale Jewell, manager, U.S. maintenance for EMKAY. Another factor keeping oil costs flat has been reductions in synthetic oil prices. “Overall PM costs remained relatively flat in the past year. Oil has continued to remain stable and fleets continue to embrace the use of synthetic oils,” said Bria of ARI. 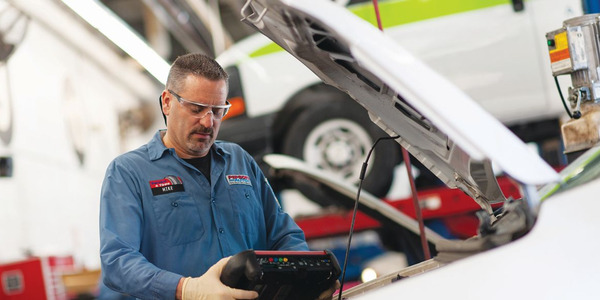 Another PM trend is OEMs offering free oil changes and tire rotations at dealerships. Most subject-matter experts anticipate that PM costs will continue to remain flat in 2017. Continued stability related to the cost of oil, along with increasing drain intervals, and the continued acceptance of synthetics will help keep PM costs stable. 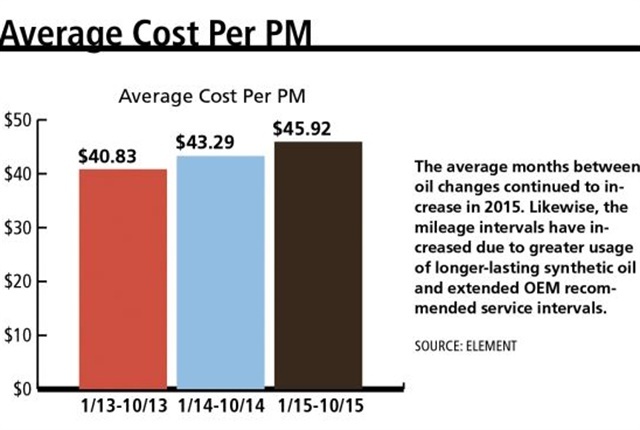 “We expect preventive maintenance (PM) pricing to remain flat heading into 2017. Stability related to the cost of oil, along with increasing drain intervals and the continued acceptance of synthetics should have a favorable impact on PM costs,” said Bria of ARI. 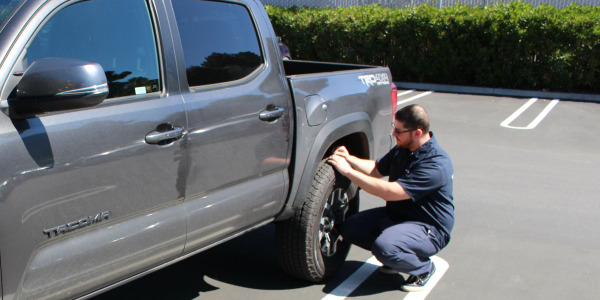 One concern on the horizon is the potential impact of higher labor rates and whether these increased overhead costs will be passed on to fleet customers. “The ongoing trend of increased costs per service will continue as more and more vehicles requiring conventional oil are taken out of service and replaced with models that require synthetics. 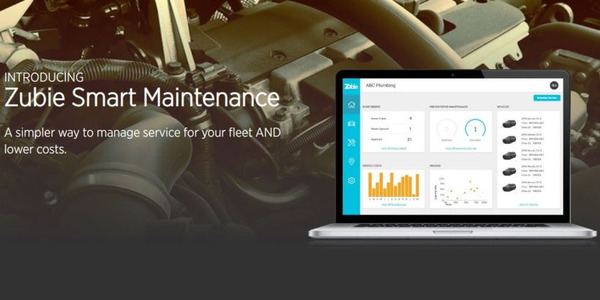 As the OEM requirements for oil change intervals update, there will be increased need for vehicle specific service intervals and preventive maintenance schedules,” said Croke of Merchants Fleet Management.